Okay first of all, I want to apologize for any hazy / weird color quality on these pics. Michael and I shot these when we were in Whitefish, Montana last week. While we were there, there were TONS of fires in surrounding cities, so Whitefish was insanely smokey and hazy throughout our stay, unfortunately! BUT. I had a few of you reach out and ask for some of my recommendations in Whitefish, which I was pretty surprised by because it’s such a small town / not super popular! Michael’s parents actually have a house up there which is why we go semi-regularly…and absolutely LOVE it. IMO, Montana is for sure one of the prettiest states in the US. 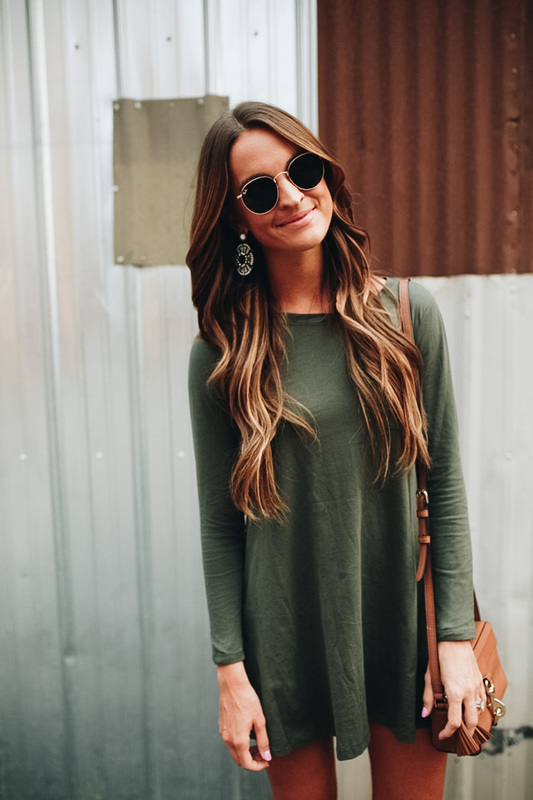 So today I wanted to share this olive green tshirt dress with y’all…but also a few of our favorite things to do in Whitefish, Montana! Brunch at Loula’s Cafe – major comfort food, home cookin style but actually really good! Latitude 48 – I don’t think I’ve eaten here but I’ve heard good things about it! Craggy Range – nice for a good, casual dinner with quality food! Also they have amazing dessert so of course I like it! Bulldog saloon – good spot for a quick lunch to grab a burger! Red caboose – cutest little frozen yogurt / coffee shop! Sweet peaks – we just discovered this place last week when we were there but they have AMAZING ice cream! I wish we would’ve known about it sooner! So if you’ve never been to Montana before…I (obviously) cannot recommend it enough. The mountains are unbelievable, the snow there is magical, and the hiking / skiing are amazing! 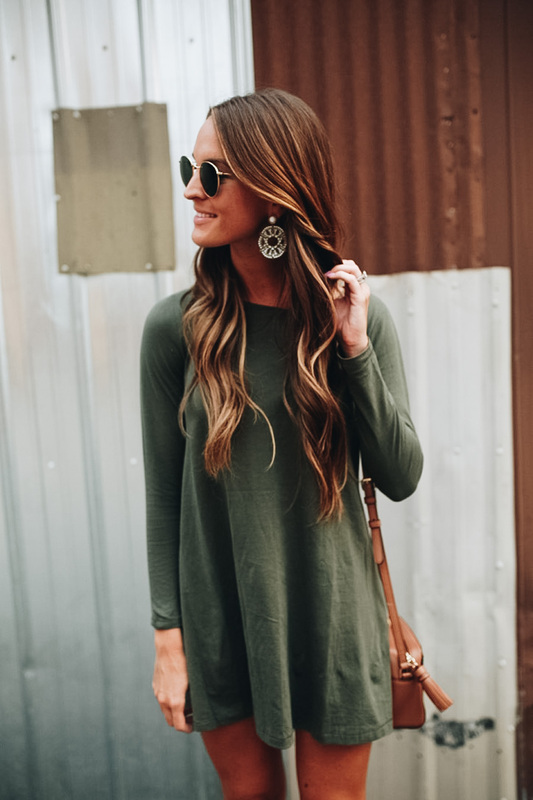 Side note about this olive green tshirt dress (which I LOVE)…I’d recommend sizing up if you are 5’5 or taller! I got the XS and you can see it’s a tad short on me. But the quality is great considering how budget-friendly it is, and it comes in several colors! Hi Lauren! For this, are you wearing the regular or petite? Thank you!